Looking for something for the boater on your shopping list? Winter can be a tough time for boaters on the Chesapeake—stuck on the unfamiliar land, staring off into the Bay or huddled by the fireplace reading chandlery catalogs, waiting, just waiting, for the day when the frost recedes, the shrink wrap comes off, the ice melts, and they will be free again to explore their preferred habitat for another summer. Whether they’re the practical type or a more fanciful marine recreation enthusiast, you can find something in our nautical gift guide to tempt them in from standing, forlorn, at the dockside and help them through these trying times with a gentle reminder that spring is just around the corner. 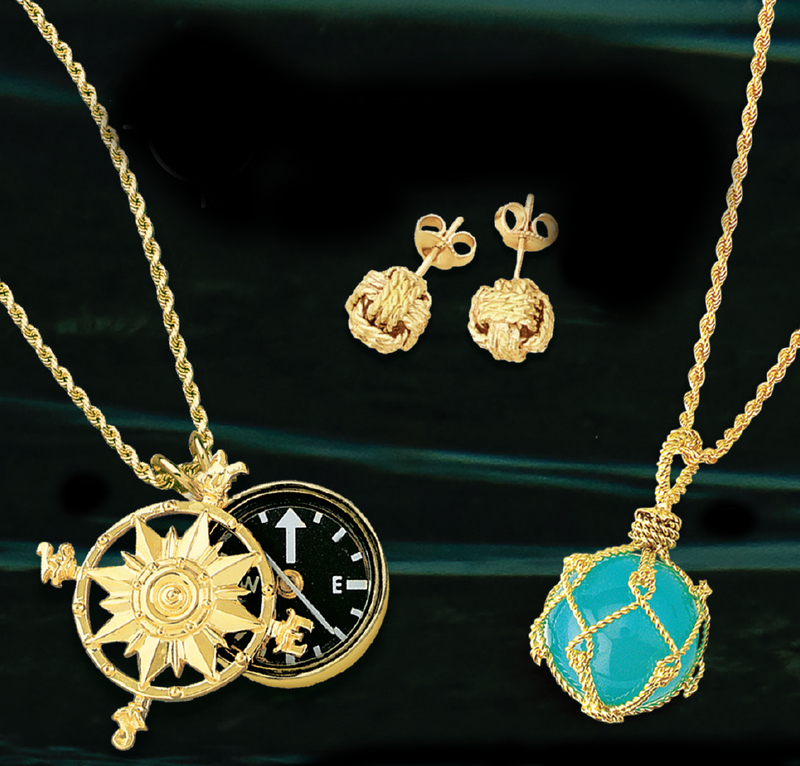 Designing nautical, gold, platinum and silver jewelry in Edgecomb, Maine USA since 1969. We are family-run, building customer relationships that extend through generations. Our mission is to deliver exceptional product design, quality and service to the customer ahead of time. Boatgirl encompasses the vision of sisters Leslie and Paige Temple of North Carolina, specializing in making durable water resistant bags for women on the water. Boatgirl bags blend superior materials and top quality craftsmanship with brilliant designs and styles that make them revolutionary. Our design philosophy originated from a desire to provide the rugged construction needed for harsh water conditions, yet our products are versatile enough to accompany any woman on any adventure, wherever that may be. All Boatgirl tote bags are made with Sunbrella® Marine Canvas, stainless steel hardware, and other high quality materials that not only hold up, but look great. Boatgirl products make great gifts for your wife, your daughters, your sisters, and yourself - check it out at www.goboatgirl.com! Cantler’s Riverside Inn is the most popular restaurant in Maryland, according to People magazine. The magazine’s food section recently released a list of the most popular restaurants in each state and Washington, D.C. Cantler’s, a longtime Annapolis crab house, was named No. 1 for Maryland.Cantler’s owners and founders, Jimmy and Linda Cantler, are native Marylanders. Jimmy worked as a waterman on the Chesapeake Bay. The Cantler family has worked in the seafood industry for five generations. In 1974, Jimmy started a restaurant dedicated to serving fresh seafood in a casual family atmosphere. Today, all seafood is inspected by experienced handlers to ensure only the highest quality product reaches our customers. We've recently launched our new personalized boating apparel and gear line! Products include custom logo t-shirts, embroidered and personalized polo shirts, hats, jackets, zip ups, pullovers, windbreakers, vests and more. Get cozy with our new luxurious beach and bath towels along with the must have monogrammed fleece blankets. All our high quality and durable gear is a must have for your whole crew! Available to the public since 1991, Coppercoat is the most durable and long lasting anti-foul currently available. Millions of boat owners are in the habit of lifting and re-painting their boats each year – Coppercoat puts an end to this costly and time consuming exercise. This hard wearing, densely copper filled resin is protecting over 60,000 boats worldwide, with a single treatment commonly providing a high level of protection for a decade or more. Coppercoat is suitable for DIY or professional application, by roller or spray and can be used on all surfaces including GRP, iron, steel, wood and aluminium. Looking for a great gift for a boater? You’ll find it here! With quite possibly the largest nautical gift offerings found anywhere, you’ll see why Fawcett is now celebrating 70 years of service to boaters all over the world. Fawcett Boat Supplies is an independent business, locally owned and operated. Our staff includes many boaters: sail, power, racer, cruiser, paddlers, and even a submariner. A singular focus on quality makes Fawcett unique and the first choice for many. Here you’ll find the most extensive selection anywhere for any boating project, whether it's electrical, rigging, maintenance, performance hardware, or an upgrade to your galley or cabin. Mantus is the best choice for your primary boat anchor. In addition, Mantus breaks down for easy storage, so there is no reason to compromise on your storm anchor choice. SailorSams.com LLC was established in 2003. American owned and operated, SailorSams provides boating & marine products ranging from savvy, 12 & 24 volt lighting options to super-duty dock cushions - all the way down to packless & dripless shaft seals. We specialize in offering quality, marine-grade products from a variety of manufacturers and distributors. Our mission is to provide excellent customer service, prompt shipping, top-notch products & competitive prices. . . Not to mention free shipping on orders over $99! · Embracing the peace of the sea and the warmth of the sun. · Envisioning a life where adventure awaits. · Focusing on your dreams to steer your ship forward. These are the jewels in your journey. This is the heart of SS Magpie. Local to the Chesapeake Bay, SS Magpie jewelry is hand crafted on both land and sea from my studio in Virginia or from the cockpit of my sailboat. The designs are inspired by a love of the ocean and the thrill of a new adventure. I use sparkling crystals to capture the sunlight, semi-precious stones for their natural energy, and sterling silver to create unique pieces that inspire your beachy, breezy spirit. Each design is a reminder of where you want your life to go. A life well lived should be filled with adventure and the sea. So pursue your dream and take SS Magpie along for the journey. Our beautiful handcrafted cannons and carriages are based off a long rich history keeping only the best and highest quality in mind. Strong Fire Arms Co was once the leader in manufacturing muzzle and breech loading saluting and yacht cannons. It is with this integrity and legacy that we now make Strong inspired saluting and signal cannons for your pleasure! Strong F.A. Co. is initially launching three main products; the Strong Saluting Cannon, the Sundancer, and the Muller Naval Deck Cannon. More original Marc Lovejoy designed products are coming soon! Whether you choose a more elaborate piece or a simpler one, we want to emphasize safety as our first priority. In our design work we take the prospect that form follows function; once the function is correct the form will follow accordingly, Our designs keep your safety first in mind. SubSafe is the first WATERPROOF + CRUSHPROOF food container for the cooler. It was designed to protect a sub sandwich from becoming SOGGY, but it's unique design works for all food items and allows you to stand it up in the cooler, freeing up more space. SubSafe includes three pieces to thread together for either a 6" or 12" container. The pieces also double as extra cups and bowls, and even as a cocktail shaker. But that's not all! Because it is completely watertight, SubSafe is great for DRY STORAGE! Load up you phone, keys, wallet, etc. and rest assured your belongings are protected. SubSafe even FLOATS, in the tragic event it goes man-overboard. SubSafe also hold and protects a bottle of WINE, great for traveling. SubSafe comes packaged in a beautiful box, making it the perfect holiday gift and is available in three colors: Seafoam Green, Hot Pink, and Charcoal Grey. Use code "CBM15" on our website www.thesubsafe.com for 15% off. Go overboard on your gift this year. SWITLIK Man Overboard and Rescue Modules offers the fastest flotation in a man overboard emergency. The MOM 8-A and MOM 8-S automatically inflate when opened and the unique Underarm Flotation Device (UFD) keeps the victim’s head and shoulders out of the water, allowing the man overboard to assist in the recovery. A 6 ft pylon attached to the UFD allow your victim to be seen and a weighted drogue keeps them in place. Durable lifting straps make getting the victim back on board a cinch. And the MOM 8-A and MOM 8-S are World Sailing Offshore Racing compliant! Two women entrepreneurs, one a 2- time breast cancer survivor the other with a crazy idea partnered up, formed a company called ugo wear and in just 3 short years brought our invention to life! Introducing "ugo" The First Waterproof Life Jacket for Your Phone. We all know that sinking feeling when a beautiful day on the water turns into an "oh no, not my phone" moment! Whether you love Android or Apple, sailing or power boating, kayaking or paddle boarding, saltwater or freshwater we can all agree having to unexpectedly replace our phone is a costly and painful experience. If you are looking for superior waterproof protection for your tech toys look no further. Our waterproof phone case is made using highly engineered materials, TPU fabric made right here in the USA by NIKE IHM and a German made waterproof zipper tested to strict performance specifications. Not just for your iphone or android our waterproof phone wallet lets you carry your key fob, passport, credit cards and cash. Our customers are amazed that their phones are fully functional while inside, you can talk, text, tweet, pin, post, snap and video both in and under the water and best of all it FLOATS! So, ditch the rice bags and visit www.ugowear.com to purchase the best insurance for your phone use Promo Code - GIFT and save big! Williams & Heintz Map Corporation has been family owned and operated since 1921, Williams & Heintz Map is a local manufacturer, with four generations of boating knowledge and experience. Included in your purchase of the new printed chart book, is a digital download of each individual chart. Now you can have the Williams & Heintz Cruising Guides on your iPhone, iPad, or Android phone too. Current Information: Our Cruising Guides contain the latest information on buoys, water depth, tidal currents, marinas, ramps, and channels.We compile navigation information from the latest National Oceanic and Atmospheric Administration (NOAA) sources.